What’s Up With Awilco Drilling? Post edited after a helpful reader pointed out some calculation errors. The conclusions reached have not changed. That’s what I get for writing after midnight. I’ve haven’t written on Awilco Drilling for a while, but the company’s never been far from my mind. How could it be, when the past five months have been one long, painful slide from over $26 to $11 per US ADR? The reason for the decline is obvious: an unforeseen and extraordinary decline in oil prices and the associated carnage in nearly all oil-related companies. In hindsight, there were obvious signs of coming weakness that I ignored. Chief among them was the large share sale by the company’s controlling shareholders. At the time I dismissed it as merely portfolio reshuffling and profit-taking. The sting of loss has a way of clarifying reality, and it now seems obvious that the Wilhelmsens knew exactly what was ahead for the sector and reduced their exposure accordingly. The past is the past and it can’t be changed, but now the question in every suffering investor’s mind is: what does the future hold for Awilco shares? First, let’s take a look at just how severe Awilco’s decline has been relative to its peers. The graphic below shows the change in Awilco’s enterprise value and market capitalization since its shares peaked on July 24. Figures are presented in local currency millions. Net debt is reduced for the balance sheet value of newbuild assets. Note this analysis does not attempt to incorporate changes in the market values of rig operator debt, which has undoubtedly decreased. Of the various offshore drilling companies on the list, Awilco’s enterprise value has declined the most since late July. On one hand, Awilco had been one of the best performers in the segment in the months leading up to the collapse. On the other, Awilco’s low leverage and robust backlog make the magnitude of the decline difficult to understand. Awilco doesn’t compete in the ultra-deep-water space, where over-supply and reduced investment will take the greatest toll. Nor should investors worry about liquidity because Awilco has no funding commitments for newbuilds and its debt isn’t due until 2019. My theory is that Awilco’s share have been punished by an exodus of yield-chasing investors concerned with the sustainability of Awilco’s dividends. Their fears are justified, to an extent. The near-certain decrease in dayrates will crimp Awilco’s dividends once the current contracts are completed. But Awilco’s current valuation seems to anticipate a near-complete elimination of earnings/dividends once WilPhoenix’s contract with Apache is up in mid-2017. The chart below projects Awilco’s contractually guaranteed earnings for the next eleven quarters, from now until the company’s final rig contract expires. These projections include a number of assumptions, laid out below. 1. WilHunter ceases operations in December 2015 and is not active for the duration of the projection. 2. WilPhoenix is inactive from mid-April 2016 to mid-June 2016 for yard time. 3. Yard survey expenses for each rig are $15 million. 4. Daily rig operating expenses are $92,000. 5. Quarterly interest expense begins at $2.19 per quarter and is adjusted for bi-annual $5 million principal amortization. 6. Depreciation is $4.5 million per quarter, increasing by $0.625 million once each blow-out preventer is installed. 7. The tax rate is 20%. Between now and mid-2017, Awilco should earn about $205 million. Peak earnings will be Q1-Q3 2015, when both rigs are in full operation. The worst will be Q2 2016, when WilPhoenix is idled for most of the quarter. Of course, reality will differ from this projection. But the most important takeaway is just how much of Awilco’s market capitalization is represented by earnings that will arrive within three years. Over 60%! Fully 46% of Awilco’s current $333.6 million market cap will be earned between now and the end of 2015. The market seems to be awarding only nominal value to Awilco’s potential earnings once its current contracts expire. To put this in perspective, the remaining metal fatigue lifespan of each rig (per the company) is around 15 years. Now, I don’t expect each rig to be employed for the full 15 years if dayrates experience a significant decline. But I do expect each rig to be employed in some fashion for at least a decade, and to have some residual value at the end of that term, if only for scrap. To reinforce the point, let’s take a look at a scenario in which dayrates for Awilco’s rigs decline by nearly 50% to $200,000 per day. The graphic below lays out yearly earnings and cash flows for this scenario. It assumes daily rig operating expenses decline 20% once the current contracts expire, which I think is reasonable for a scenario in which rig-workers and suppliers suddenly find their services much less in demand. This projection, like the one before it, includes a lot of highly uncertain projections, like another two-month yard stay for each rig in 2020/2021, selling off the rigs for half of book value in 2024, and the release of all net non-cash working capital in the same year. It includes $25 million special capital expenditures for each rig for upgraded blow-out preventers, which are then depreciated over a ten-year schedule. Using these assumptions, the present value of Awilco’s future cash flows is $356.2 million, or $11.86 per share. At the current price of $11.11 per US ADR, it seems the market is expecting a scenario worse than this: one in which dayrates decline even more, or Awilco’s rigs have shorter lifespans, or where one or both rigs is off-lease for substantial amounts of time. If anything short of a complete collapse in offshore drilling dayrates is ahead of us, Awilco Drilling is likely a good buy at these levels. If a complete collapse arrives, Awilco will still reap about 61% of its market cap in its earnings over the next 11 quarters, which should provide some downside protection. The next big test for Awilco will be if it can re-lease its WilHunter rig to Apache for 2016, or failing that, lease the rig to another operator for a reasonable time period at a dayrate remotely similar to what it earns now. If they are successful, I expect the stock to experience quite the relief rally. If not, the stock could find itself languishing at these levels for a while. Apache and Awilco must agree on terms for 2016 by late February, or Apache’s option will expire. Given Awilco’s strong management team and clean balance sheet, I expect them to find a solution for WilHunter. Awilco’s value has been reduced by the rapidly deteriorating oil market, but I view the stock’s decline as too far, too fast. I made a mistake by not selling Awilco high. I don’t intend to compound my mistake by selling low. Edit: In writing this piece, I wasted far too many words trying to say something simple. Suffice to say, Awilco’s current enterprise value is equal to contractual earnings from now until mid-2017, less yard expenses, plus net receivables and inventory, plus 54% of rig book value (including the new blow-out preventers.) If Awilco’s rigs are worth more than 54% of book value, it’s very likely that Awilco is under-valued. My opinion is pretty clear. Alluvial Capital Managment, LLC holds shares of Awilco Drilling Plc for client accounts. 31 Responses to What’s Up With Awilco Drilling? Thank you for your calming analysis. I haven’t still after five years developed strong enough nerves to absorbs such a decline. I don’t know if it ever gets easier. Nobody likes losing money. My defenses are modest diversification and really knowing the finances and prospects of the companies I invest in. I don’t own a lot of stocks, but I do own enough so that even if one or two blows up completely, it won’t cost me potentially years of returns to get back to even. Awilco’s intrinsic value has certainly declined as oil plunges, but I think this is a situation where the market has over-reacted dramatically. Still regret trying to be greedy on this share and putting a limit sell a few cents above the share price at the time. Never got hit. That’ll teach me. Including dividends, I’m just above break even. Definitely hurts, especially when I had once scored nearly a double in capital gains alone! Mea culpa for ignoring some obvious signs of weakness. I think very little downside risk is present in the current valuation and I like Awilco as an option on stabilization/upward movement in oil prices. Nice follow up and good to see that I’m not the only one who thinks Awilco is undervalued. Awilco is by far my largest position with 33% of my portfolio ( you can imagine 2014 will be my worst return year ever), but I still see perceive this as a great buying opportunity (but I may be biased). – Remaining Fatigue Life is 2031. So we have still 16 years to go. – Awilco is break even at $150k/day and is one of the lowest cost operators in the North Sea fleet. – Oil and gas is a very cyclical business. Oil prices have come down (hard) before and have increase (hard) as well. – Some day in the future prices will increase again. they bought more Jack Up’s and/or Floaters. Couldn’t have said it better myself. Those are all salient points. At least we’ll have some nice reinvestment opportunities for the 2015 dividends at this price level. 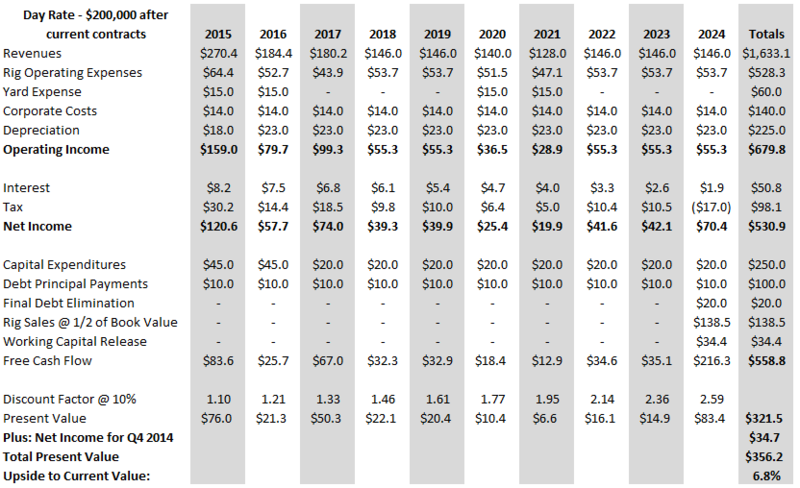 Awilco estimates the per rig daily opex in 2015 to be $100K (due to rising costs). Over the past year or so the efficiency has been insanely good — I suspect it is nearly impossible to maintain this efficiency over the longer term — I expect over the longer term that there will be small accidents, little problems, etc. that keep uptime from being so high. Also expect as the rigs get older — maintenance capex should go up. The risk for awilco isn’t getting a lowish day rate: ($250k-$300K per day) — the risk is that they aren’t able to strike a deal at all — due to lack of interest/competitive pressures. What does “contractually guaranteed” ultimately mean? Are those fees/revenues reserved by the counterparty (or is there insurance) in case they default or refuse to pay? Thanks…. The risk of getting no contract is absolutely a risk, but a small one. Even with oil pricing substantially down there will be new well drilled, old wells cleaned and very old wells abandoned. Awilco is a very low cost operator. So if the price competition is really heating up, I expect Awilco to be able to defend itself by offering a price that other cannot match. Will this hurt revenue and ultimately profitability? yes, of course. But in the long run we will benefit as you can be assured that some rigs will be scrapped if this downturns prolongs. Efficiency is indeed good, but that has to do that they have good rigs and good crews. I don’t see why that should go down? All the causes for occasional downtime (not structural downtime) will be addressed with the SPS. Exactly as it is stated. The contract revenue is guaranteed (except for ‘an act of God’ situation) and Awilco can legally force the payment of this revenue even if the rig is not used. Some food for thought – billionaire John Fredriksen keeps buying Seadrill shares….which is substantially more levered than Awilco and has a lot more competition in UDW market in the coming months/years. Is the $60/bbl price the “new normal” for oil prices? For a commodity whose demand is among the most inelastic on this planet, and is almost guaranteed to rise in the coming decades (due to population growth, Asian economies booming) and whose marginal barrels are more expensive/harder to find…how can oil suddenly in a span of months decline by over 40%? Even more absurd is that there isn’t anywhere near a 40% glut in supply…maybe a percentage point or two supply, at most. Here’s the thing – even most bears agree that oil won’t be at this price in the next say – 5 years or beyond (barring some unforeseen extreme renewable breakthrough). We seem to be witnessing a panic/sell0ff/bloodbath that rivals late 2008-early 2009, and with a much better justification now, than then. 1. To claim that oil prices caused this is a gross oversimplification. Oil prices acted like steroids(or leverage, or whatever other analogy you want to use). We got to where we were going, just a little faster, and probably with more deleterious effects down the road. There was a looming supply glut regardless of where oil headed. Given the low paybacks for deepwater drilling, older rigs were going to get displaced. Seadrill warned of this several times – even when oil was well over $90/bbl. 2. The chief problem with Awilco (or any driller for that matter) is the unknown unknowns. We know the upside – it’s the announced contract. The downside is unknown. Can these contracts get cut midway through? Can the oil company abandon the project with 60 days notice and simply pay a fee? These, and other, modifications can happen overnight. Just look at Statoil and what they’ve done to several rigs. 3. Awilco operates old rigs. This is a big deal, I don’t care what IR tells you and that steel life figure is great on paper, but a very small part of the actual truth. Old rigs cost more to maintain and lack critical safety features. New rigs have significantly higher profitability. Almost every single rig under construction has safety features unheard of 5 years ago. Oil companies can demand rigs that are safer and better. The only way that old rigs can compete is on price. That’s it. 4. This isn’t deepwater, but it will be impacted by the deepwater rig glut. All the new deepwater rigs under construction are better designed and far more efficient – regardless of their water depth operation. Ultra deepwater rigs will compete down with deepwater rigs, which will compete down with mid-water rigs…etc. The glut will (and has) cascade(d) down. Awilco operates in a segment that currently has ~15 rigs working. There’s another 151 (semi-subs that currently work in water depths of 1500ft or greater) that will slowly come off contract and compete down. Not all of them, but certainly some of them. These rigs will accept materially lower rates because they can and have to. I would be happy to keep adding points. In my opinion, Awilco should trade at some NPV of contracted cash flows with a discount rate. There is a very real possibility that these rigs get cold stacked at the end of their contracts – or get offers for contracts that are barely over operating expenses. There have been large reductions to offshore capex over the past couple of years and this will not reverse itself overnight – regardless of where oil is. For many offshore players there will be more hard times ahead and several restructurings/bankruptcies. Thanks for your comments. Contrary opinion is always welcome here. The question seems to come down to whether or not Awilco’s rigs will be employed in the long-term. This will be determined by the supply situation as well as breakeven points for offshore drillers, which is determined both by oil prices and by rig operating costs. I tend to think sector woes will reduce the competition going forward, with companies employing their newest, most efficient rigs in the harshest environments. I have trouble imagining operators contracting UDW rigs for legacy fields in the North Sea. Furthermore I’d dispute the characterization of Awilco’s rigs as inefficient assets. Both rigs underwent substantial upgrades when they were purchased just a few years ago, and will undergo additional upgrades and maintenance at their upcoming yard stays. Clearly you’ve made more money here recently than I have, so I’d be foolish to dismiss your analysis. There seems to be a lot of echoing of ‘lowest-cost operator’, to piggyback off Ian’s comments (I am sure I do not speak for his opinion nor am I nearly as competent in this sector) but all offshore rigs are highly differentiated. They may be the lowest-cost operator of 25 year-old rigs with upgrades but that’s about it. A lot of times, the exploration companies know what specs they need for their rigs and then they go shopping for price, it almost never happens in reverse. As contracts run-out and bidding may intensify for the fewer amount of new contracts being offered. The question of whether Awilco will be able to obtain a new contract(s) or will have to shelve one or both rigs is a real concern. Even though they are competitive on price, I haven’t seen a compelling argument that Awilco offers a compelling value to oil companies looking for their services. The best value is ultimately what is contracted-out. I see Awilco as extremely risky with the potential of <0% returns over an extended period of time. The dividend may actually be a negative in this case, locking in negative investment returns due to limited flexibility and 'flighty' shareholder-base. I was interested in Atwood Oceanics Inc (ATW) but I can't get past how terrible the industry is for a lot of the reasons Ian C mentioned. The 'glut' of rigs is actually an over-supply of 25-30 year production assets where safety and reliability are in the minds of politicians and each new wave/generation of these assets are more efficient, safe, reliable, etc. This actually reminds me a lot of the airline industry where the drillers are the airlines. Every successive investment by rival companies actually lowers your own margins due to constant efficiency gains. Good luck, your blog is always a great read! I could see why Awilco looks tempting but there's no need to swing as this low-and-away slider. The fastball down-the-plate will come. Fair points. However I don’t think that people are saying Awilco’s efficient operations make their rigs more attractive to oil companies. Naturally, Apache and Hess only care about meeting their needs at the lowest cost possible. People bring up Awilco’s low break-even point because it will enable them to profit at rates that would have other rig-owners stacking their rigs, and increases the chances that Awilco will generate cash flow going forward. In my view, investors are richly compensated for the risk of the rigs going off-contract at these levels. However, I certainly agree that there are many other opportunities out there and anyone who judges Awilco too risky should certainly pursue those instead. It occurs to me that Awilco was fortunate to get their refinancing done when they did. I expect they’d have to pay higher rates if they tried in current environment. Thanks for putting up your article! Without a doubt! Honestly the debt looks like a decent buy for bond investors. YTM is 9.6% (higher if your holding is redeemed earlier) and there’s a ton of asset and cash flow coverage. 7.00% coupon bond priced at 89.75 with an April 2019 maturity works out to 9.97% YTM. So, my initial estimate was a bit low. Also keep in mind that 89.75 trade is from October. I don’t know where the bonds trade now. Some of the paperwork regarding the bonds on the company’s website says that they are traded on the “Oslo Bors.” There is a lot of good information about the company including a chart of the other rigs operating in the north sea, the rates that they command, and their depths. Do you know how one could purchase off of this exchange? I doubt the bonds are traded anywhere else. If your broker allows you to trade European bonds, it’s worth an inquiry. I checked up on the bonds. Vanguard is telling me that at least $200,000.00 is needed to source an offer on a bond like this. So they are quite expensive. I’m not sure if its worth asking other brokers. Thanks for your response. Appreciate it. FWIW, I reverse engineered your model and I got a fair value about 15-30% below current market values(assuming investors demand a 10% discount rate and rigs stay out until 2024). My only adjustments were rig opex and rig sales at the end. Most of the rig opex costs are fixed and don’t adjust with revenue. $91K/day/rig is pretty much constant and will probably go up. Your assumption of 20% less implies that a semi-sub can be run for less money per day than a HS/HE jackup. Given the size and differences of wells – I think that’s impossible. Therefore I think it’s prudent to keep rig opex relatively constant. Rig sales – at the end of their life these will be lucky to go for scrap value. Given the number of rigs across all classes that will be retired I think it’s quite aggressive to assume they get sold at a reasonable value. Scrap value is the most likely. In certain cases rig owners pay someone to take the rig off of their hands. I assumed a generous $650/ton payment to Awilco for both rigs. So in 2024 I got a rig value of more than $100M less than what you modeled. Anyways, those are my thoughts. I’m not short Awilco but if rates drop the way I believe they will, I can make a case for it. Awilco has zero scale and not that many options. There is a very real risk of permanent impairment in my opinion. Thank you for your comments and for presenting a bear case! In your projection, your tax assumption doesn’t match management guidance. The tax rate for Q1 2015 onward is expected to be 15%, down from 22+% for 2014– based on the recent modification of the ownership structure. That amounts to ~$12M in the first scenario and ~$25M in the second. More if rates are better than the worst case scenarios, of course. In their quarterly reports (not the presentations), Awilco states that they use a scrap value of $15 each for the rigs. I don’t know how valid that might be in a real-world situation. It will be interesting to see what happens. I won’t be surprised if the dire case the market seems to expect turns out to have been overstated. Thanks for your work! You’re right. My tax assumption is too conservative. Then again my terminal value for the rigs was too aggressive and is based on more aggressive capex than will actually happen. All in all, I suspect it’s mostly a wash. I try to avoid over-specification when I’m constructing a model. I find that trying to nail down every last figure results in a nice tidy figure, but also in over-confidence. I’d rather try to get things generally right and see if it tells a much different story than the market is believing. Everything depends on those lease rates. Until 2004 rates were almost always $100k or less/day, after 2004 they shot upward. So did the price of oil. If oil stabilizes at $70 or above Awilco is probably ok. Much below that and we could return to really low lease rates and Awilco is in serious trouble. Market is being pessimistic but probably not irrational right now. 1. Why do you project that the WilHunter will not operate after Q4 2015 vs the WilPhoenix, which you’re giving significant additional life to? 2. Speaking to IR, it seemed that the UK shelf is high cost enough that E&P cos don’t want to pay for newer rigs in the area, and so most of the rigs that operate in the area are quite old. I was wondering what you made of that observation. Is it a possibility that capex in the UK shelf is hit hard by the lower oil price? It was just a conservative assumption. I assumed WilPhoenix operates for longer simply because it is contracted for much longer. The North Sea market is somewhat sheltered from declining oil prices, but not entirely. On the other hand, deep-water markets may rebound sooner as many planned newbuilds will be canceled. Does your first chart (which projects contractually guaranteed earnings) account for the contractually guaranteed commitments of the BOPs? If the BOPs are accounted for, what would the net income would be in that case? Thanks. Thanks for the great writeup. I have a couple of questions if you don’t mind answering. 1. Where did you find the $15 million cost for the yard expenses? 2. Where did you find the info regarding new BOPs needed for the company, and the costs for them? I can’t seem to find anything about that in the AR. I figured they wouldn’t need any new parts given they were refurbished 5 years ago and the contracts last only 2 more years. 3. Are you thinking about cold stacking at all, and adding this to the costs in case they can’t find new contracts for either of the rigs (or both)? Thanks again for sharing your thesis. Hello, unfortunately I am no longer an Awilco shareholder and I have not kept up with the current estimates or outlook for the company. The cost for yard service and the BOPs are disclosed by the company in various quarterly reports. I recommend checking the annual report. Rigs require a yard stay every 5 years and the new BOPs are meant to improve the rigs’ remaining usable life. Though with rig rates having fallen so much, who knows if they are still a good investment?